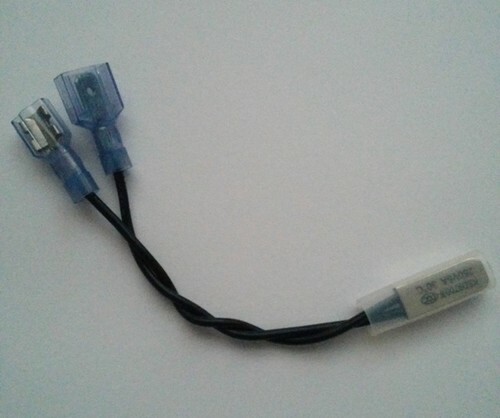 This Ambient temperture set switch is used to automatically control the DC voltage to the OEM fans or your add on fans. This added fan switch has been very very popular for customers to add to their set up of fans, so as the out side tempertures get into a degree that the refrigerator needs the faster air to flow through it's condenser. The more air flow through the condenser it will give a better cooling inside power by removing the heat from the condenser fins. This switch will operator as many fans as needed. The nice part about this fan switch, it allows fans to run when needed during the hotter weather and off when used in cooler weather. Nice to have air flow during the heat of the day and OFF during the cooler nights giving a quite operation, but will activate if night time temps gets above the set temps of 85 degrees. The refrigerator does not need to be pulled to add this fan switch. A great simple addon parts.